Enter to win fun raffle prizes for you and your dog at each event. Proceeds from the raffle will benefit Great Dog Rescue New England and Red Dog Pet Resort & Spa will be onsite with free giveaways too. Great Dog Rescue New England (GDRNE) is a 501(C)(3) non-profit, shelterless, all-breed rescue group headquartered in Massachusetts. Our group is comprised of volunteers from all over New England who love dogs and want to help those that end up homeless through no fault of their own. Loyal and loving dogs turn up every day in New England and Southern shelters, as owners turn them in or they’re found roaming the streets after being dumped. To date, we have placed over 11,000 dogs - and counting! - with their forever families. 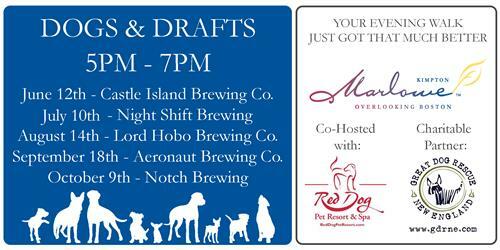 Boston's premier pet care provider, Red Dog Resort & Spa is thrilled to be a supporter of Dogs & Drafts at the Kimpton. Whether your pup needs daycare, a pool party, a bath and fresh haircut, or a home away from home while you travel, you can count on Red Dog to treat your pet like our family. *All Dogs must be leashed at all times of the event. *In the event of rain, the event will be pushed to the next week.